If you live in Greater Boston, one thing is certain: You have walked the Freedom Trail a few too many times. 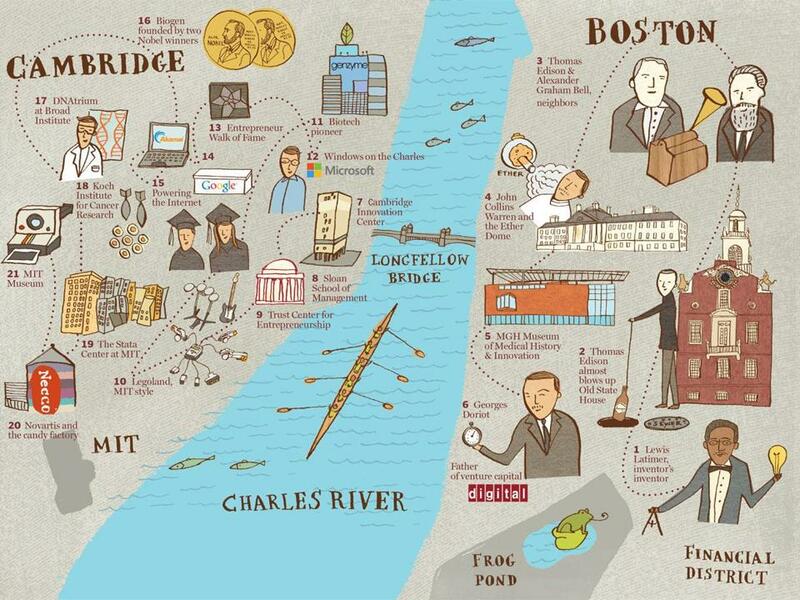 So I’m proposing a different kind of walk through Boston and Cambridge: an Innovation Trail that focuses on the past, present, and future of innovation here. We’ll always have Paul Revere’s place and Old Ironsides, but what about the incubator where Thomas Edison and Alexander Graham Bell tinkered or the world’s only “Walk of Fame” for entrepreneurs? The Innovation Trail picks up just a few years after the Freedom Trail leaves off: The newest spot on the old trail is the Bunker Hill Monument, built in 1842. The oldest stop on this new trail is the Ether Dome at Massachusetts General Hospital, where surgical anesthesia was first demonstrated successfully in 1846. The Freedom Trail was essentially invented by a newspaper columnist in 1951, who said it could be rolled out with just “a few dollars and a bucket of paint.” In 2013, the paint isn’t necessary. I created a digital map of this new trail, along with videos, audio, text, and photos related to the stops. You can access it using a free mobile app called Moveable Feast (find it in the iTunes Store). It includes historic perspective from Bob Krim of Framingham State University and video interviews with people like Steve Vinter, who runs Google’s Cambridge office, and Doug Williams, head of research and development at Biogen Idec. 1. 30 School St., Boston African-American draftsman and inventor Lewis Latimer once worked here. He helped Alexander Graham Bell create the drawings used for the telephone’s patent filing and later worked with Thomas Edison to extend the useful life of the light bulb. 2. Corner of Court and Washington streets, Boston, near the Old State House Boston’s most historic sewer. Few people remember that Edison began his career in Boston. He used a sewer at this intersection to dispose of explosive chemicals used in his lab, pouring them into sarsaparilla bottles and lowering them down. 5. 2 North Grove St., Boston Showcasing the evolution of medicine, Mass General’s Museum of Medical History and Innovation opened in 2012. It’s free, open weekdays only, 9 a.m. to 5 p.m.
6. 12 Lime St., Boston The former home of Harvard Business School professor Georges Doriot. Doriot started what is regarded as the first venture capital firm, Boston-based American Research and Development. Among its investments: Digital Equipment Corp., which turned the firm’s $70,000 investment into more than $350 million. 7. One Broadway and 101 Main St., Cambridge The two buildings known as the Cambridge Innovation Center may be home to a denser collection of start-up and venture capital firms than anywhere on the planet. The center, founded in 1999, also served as the first Massachusetts home for tech giants Google and Amazon. 8. 50 Memorial Drive, Cambridge, MIT Sloan School of Management Founded in 1914, the Massachusetts Institute of Technology business school was recently ranked in the top five in the country, just behind the Wharton School at the University of Pennsylvania. Its alumni have started or run companies like Ford, Zipcar, Hewlett-Packard, Boeing, and Genentech. 9. 1 Amherst St., Cambridge MIT’s Trust Center for Entrepreneurship is where student entrepreneurs learn startup skills and work on their own ventures, using free office space. MIT’s living alumni have founded more than 25,000 companies that employ more than 3 million people. 10. 75 Amherst St., Cambridge The Media Lab at MIT has spawned products like Lego’s Mindstorms robotics kit, the iWalk prosthetic foot, and the video game “Rock Band.” A first-floor exhibition space, showcasing the work of professors and students, is open to the public. 11. 500 Kendall St., Cambridge Founded in 1981 with a focus on treating extremely rare diseases, Genzyme was part of the first wave of biotechnology companies. 12. One Cambridge Center, Cambridge This is one of two large Microsoft facilities in Kendall Square, housing a research team as well as product development and regional sales. 13. Outside the Kendall Square Marriott, Cambridge Created in 2011, the Entrepreneur Walk of Fame recognizes founders like Steve Jobs of Apple and Mitch Kapor of Lotus Development Corp.
14. 5 Cambridge Center, Cambridge Google developed key parts of its Android mobile operating system in Kendall Square. In 2011 the company paid $700 million for ITA Software, a Cambridge start-up specializing in airfare search. 15. 8 Cambridge Center, Cambridge Founded in 1998 by MIT students and a professor, Akamai Technologies uses 127,000 servers around the world to help customers speed delivery of digital content like Web pages and videos. 16. 10 Cambridge Center, Cambridge Biogen Idec’s major products treat multiple sclerosis. The company was started in 1978, and two of its founders, Walter Gilbert and Phillip Sharp, have won Nobel Prizes. 17. 7 Cambridge Center, Cambridge The DNAtrium at the Broad Institute offers free, interactive exhibits exploring insights into human biology, and how they lead to treatments. 18. 500 Main St. Cambridge MIT’s Koch Institute for Integrative Cancer Research works on new approaches to treating cancer, like nanoscale “smart bombs” that can find and destroy tumors with fewer side effects. 19. 32 Vassar St., Cambridge Inside the Stata Center at MIT are labs focused on computer science, artificial intelligence, and robotics (they gave birth to iRobot Corp.), and a small, ground-floor exhibit about student “hacks,” or pranks, through the years. The creator of the World Wide Web, Tim Berners-Lee, works here. The building is located on the site of what had been known as the Rad Lab, where half of the radar systems deployed by the US military during World War II were designed. 21. 265 Massachusetts Ave., Cambridge Open daily, The MIT Museum showcases technologies from the slide rule to expressive robots, as well as archives from Polaroid Corp., founded a few blocks away. It’s also home to the world’s biggest collection of holograms. The Freedom Trail peters out in Charlestown, far from an MBTA stop. The Innovation Trail is more considerate: You end up just about three blocks from the Central Square T station. And even closer are two popular hangouts for MIT smarties and the start-up set: Miracle of Science, for those who’d like a beer, or Toscanini’s if you’d prefer a scoop of ginger snap molasses ice cream. If you’re among the first to walk the Innovation Trail this summer, send an e-mail and let me know what you think.